First Aid 2013 – Any edition will do, although this is a must for board studying and you’ll probably want to keep your notes together in one book from the beginning. You can (and should) use this book in every course to get a broad overview of the high-yield concepts of each system/topic. Note that the 2012 is riddled with errors. Apparently converting to color causes typos. I bought the latest version when I started (2011) and then the latest when I started board studying (2013). I suggest getting the 2013 edition for your first year now. It’s also in color and is a condensed version of everything you will need to know for the boards. Once second year comes around, I would definitely purchase the latest (2015 edition) which comes out around the beginning of January so you have the most up to date edition for boards. Be sure to also check the errata online for continuously updated lists of errors. BRS Physiology – This updated Board Review Series book covers all of the major body system physiology (neuro, cardio, GI, endo, and repro). Be sure to get the updated 5th Edition. It’s must easier to read and the tables/graphs are well thought out. Many of the classes in the same order as the book presents the material, making it really easy to keep up with the class. Linda Costanzo is the god of physiology! Atlas of Human Anatomy (Netter’s) – One of the best anatomy books I’ve used. Netter’s isn’t great for everything but it’s quite encompassing and the professors teach from Netter’s mostly, so it’s a must have when studying anatomy. Each tank is required to have one “wet” copy at their tank as well. It can be an old edition. I also use a couple other anatomy resources, see below (MSS). USMLE Road Map: Histology – All of your histology courses follow this book almost to the T. It provides a very high-yield outline of the material, labeled images, and practice questions. The book was written by a former anatomy professor. Do the practice questions every time for each topic, you may see them again! Robbins and Coltran Pathologic Basis of Disease – Yes, it’s expensive and heavy, but you will NEED this book, or at least the contents within. You will use it from MOD1 through the remainder of your courses and all throughout year 2. Some of the chapters are a bit long, but it reads fairly easy and makes pathology understandable. OMT Review – Hands down, the most comprehensive osteopathic review for boards and high-yield for OMM class. Sometimes revered to as the “green book,” it’s broken down by anatomical section, like classes are. There are good review questions and pointers for each topic. This book, plus an extra week is what I hear is needed to study/review for the COMLEX after taking the USMLE come second year. Atlas of Osteopathic Techniques – A required text, not much to say. You will definitely use this for all of your techniques and need a copy of this in lab every time and when you practice for your clinical skills competencies. It’s pictures are pretty easy to follow, just got to memorize all of the techniques for each section. Thieme Atlas of Anatomy: General Anatomy and Musculoskeletal System – Optional. It was required for us, but the curriculum has since changed where Netters may suffice as your anatomy text for OMM. This is a good supplemental on the back structures as it has very detailed images of the spine and many of the larger muscles. This is probably best purchased used or directly from the Thieme store. There’s a coupon code floating around school somewhere that you can probably pick up at orientation. I think I got mine from the SAAO booth (OMM club). Cell science is a course unlike any other. You’ll hear “just get through cell science and you’ll be good.” This is partly true. It’s overwhelming, but you’ll get through it and classes will seem to get harder and harder as the year progresses (and they will). Principles of Biochemistry – Doesn’t have to be the latest, they’re all pretty much the same between editions. The online copy and content is nice to have, but not needed. Just make sure you have a copy to reference. Honestly, if you focus on the powerpoints, the biochem pathways in First Aid, and what is covered in class, you’ll be golden. MSS1 is your first typical year 1 course. It’s heavy on anatomy with a good bit of muscle physiology that must be mastered. Color Atlas of Anatomy – This is a high-quality photographic depiction of many prosected cadavers. On a practical, it will more or less, look a lot like these images. The professors try (most of the time) to give you landmarks and make it look like this book. If you don’t like studying in the lab, this is a must so you can see what it really looks like and not just a pretty Netter picture. There’s many anatomical views of each part with numerous (sometimes too many) labels. It’s great for quizing and orienting yourself. Grant’s Atlas of Anatomy – No idea who Grant is (not the author), but these drawings are fantastic. Unlike Netter’s stylized and artistic depictions, these are accurate, easy to see, and best of all, simple to read and understand. IMO, Grant’s has the best head and neck anatomy pictures. Along with Anatomy, Grant’s also covers other important things like innervation, lymphatic flow, and blood flow which Netter’s often fails to cover. Many professor images do come from this book as well. BRS Gross Anatomy – I would suggest having a copy (older edition is fine) to do the practice questions. You’ll likely see them again 😉 and this book covers many high-yield concepts. Neuro is probably the first class where things get really real. The material is intense and plentiful. Don’t get behind. Study the brainstem and spinal tracts the most. They are easy to mix up and you must keep the pathways straight and know exactly where they are. Neuroanatomy: An Illustrated Colour Text – This textbook may or may not be required for the Class of 2017. The course director has since changed. I used this in an undergraduate neuroanatomy class (as it was the required book for that class) and found it extremely useful in neuro in med school, especially for the brainstem. It has very nice illustrations, photos, and explanations that break down neuroanatomy giving a good introduction to the topic. Each chapter is very concise and gets to the point. Clinical Neuroanatomy Made Ridiculously Simple – The professor highly recommended this book, but I never used it. It was very helpful for many in the class.The Made Ridiculously Simple (MRS) is nice in that it has many helpful hand-drawn cartoons and pneumonics that stick in your head (mostly because they’re so poorly drawn and cheesy). Grant’s Atlas of Anatomy – for head and neck anatomy. Rapid Interpretation of EKG’s – A really easy to follow step-by-step guide to reading EKGs. These are easy free points on test if you know how to interpret them. This book breaks it down with large pictures and font (literally one major concept per page) that reads very quickly. Cardiovascular Physiology – I didn’t buy this, nor did I use this much. Just be sure you have access to a copy in case you need a reference for powerpoint images and physiology graphs (go to the library). This is the last and probably most challenging anatomy section. Pelvic anatomy gets confusing, so be sure to study as many cadavers in lab as you can because they all look slightly different and you need to see different anatomical views of both males and females. A one week course of drugs and basic pharmacology (pharmacokinetics and pharmacodynamics, drug interactions, etc.) before spring break. It’s probably he easiest class all year. Just follow along the notes and do the practice questions. Robbins and Coltran Review of Pathology – aka “Red Robbins.” This question/answer book is great for reviewing each chapter of Robbins. Anytime you have a chapter, be sure to go over these questions. Not all are relevant, but some will pop up again. This book is a must have for second year tests and prep board studying! The Immune System – Go to the library and reference this book if needed. You won’t find any questions coming out of this book that can’t be found in your powerpoints. All the images come from this book, so it’s good to read the captions and reference. These are the last two classes and are sort of an introduction to classes second year. You’ll mostly have lectures and MLMs in the morning and DSA study time in the afternoon. Don’t waste your afternoons, especially during MOD II, it’s worth 10 credit hours and the material takes a while to wrap your head around. Microbiology Made Ridiculously Simple – Bugs and drugs, you just have to memorize it all. Use tables, use this book to help you remember the pathophysiology and keep it straight. This is the class textbook and rightfully so. It’s very easy to read and follow along. 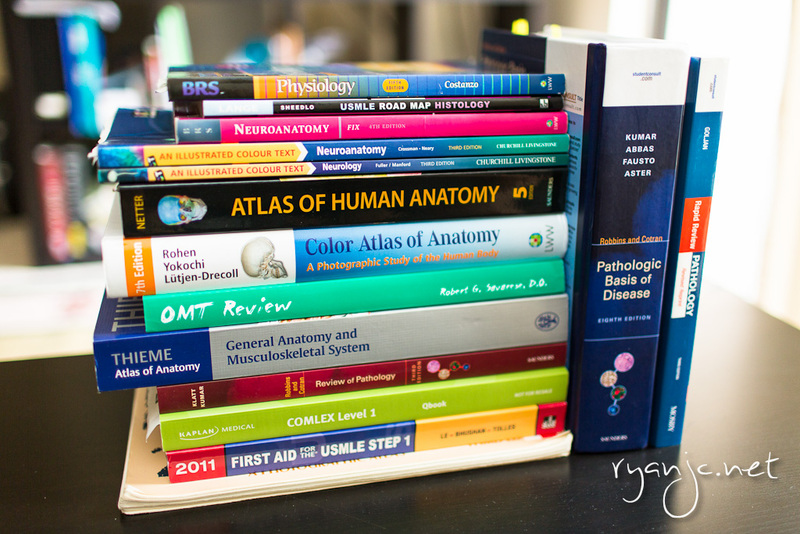 … And that’s it for my high-yield list of books to buy for your first year medical school! Good luck! If you have any questions or comments, don’t hesitate to drop me a message! Previous PostGolden SkyNext PostDOUBLE RAINBOW!